UK based Prospekt released their first EP in 2011; an untitled four track album that still is available as a free download on Bandcamp. 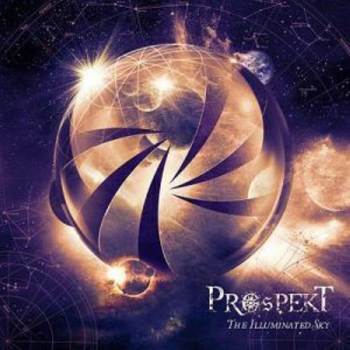 Two years later Prospekt returned with a full length album, called The Colourless Sunrise. After another four years and a line-up change, the successor The Illuminated Sky was released in 2017. Where vocalist and keyboardist Richard Marshall fronted the band during the debut album, The Illuminated Sky sees him replaced by vocalist Michael Morris and keyboard player Rox Capriotti. The remaining members are bandleader and guitarist Lee Luland, who also can be heard on several OSV albums (see review Decade, 2017), bass player Phil Wicker and drummer Blake Richardson. As special guests, virtuoso guitarist Greg Howe was brought in to play a solo on Alien Makers Of Discord and Dragonforce vocalists Marc Hudson contrasts Michael Morris during the final epic track Where Masters Fall. When I compare this album to the previous one, the overall sound has been polished to perfection, where as the debut had a slightly rougher, pronounced overall sound. Nevertheless the music of Prospekt's The Illuminated Sky is pretty impressive. Morris voice is a bit higher and adds a bit of a Helloween touch to the US progressive metal style the bands sees themselves in. Bands like Psycho Drama, Dream Theater and Symphony X surely can be heard as influences, but also more melodic metal bands as Circus Maximus. I also think the addition of the new amazing vocalist Michael Morris will lead to the next step for this promising band. Opener Ex Nihilo is a nice kind of interlude, highlighting Dream Theater style keyboards and powerful riffs that lead to the seven and a half minute powerhouse The Illuminated Sky. Morris vocals tend to give this track an “old” nineties feel and combined with the pronounced drums and “all over the place” guitars, the first killer track is in. Titan continues as a high speed powerhouse, delivering one massive riff after the other. This typical track makes the vocals of Michael Morris really stand out, but don't forget the heavy guitar solo and the delicate keyboards that can be heard underneath all the guitar power. Just a minute and a half, Distant Anamnesis shows just piano, keyboards and a massive voice, neat! Prospekt is taking the foot off the throttle on the fine mid-tempo Beneath Enriya, here the influences of European, or perhaps more, Scandinavian bands can be heard. Despite an occasional double bass drum, the melodic aspect rules on this fine composition, highlighting guitars as well as the nicely dosed keyboards. The tune In The Shadows Of The Earth tends to be a more symphonic track with early Dream Theater influences; listening to the guitar I hear some similarities with John Petrucci, during the When Dream And Day Unite (1989) album, which suits me perfectly well. Also the combination of guitar and keyboards/piano works really well on this track. The first real epic is Alien Makers Of Discord, an amazing progressive metal track, which guests Greg Howe. Although the vocals are wonderful, the attention goes to the brilliant instrumental parts of the track; the balance and the absolutely amazing guitar solo! Neo-classical power metal is the first thing I think of, when I listen to Cosmic Emissary. A strong song with a surprising end. Akaibara turns out to be a relatively smooth symphonic ballad, creating a moment of rest during the rollercoaster that is The Illuminated Sky. OK, did Prospekt save the best for last? Judge yourself, but for me the bombastic, powerful epic Where Masters Fall is one of my personal highlights. A long symphonic keyboard intro is followed by nicely dosed guitar riffs and the vocal combination of Michael Morris and Marc Hudson is quite amazing. Both vocalists push each other to the absolute heights. What a way to end an album. Damn, this is a good one. If you are searching for an incredible powerful progressive metal album and are looking for a fantastic vocalist and a powerhouse virtuoso guitar player, who also write some fine compositions, stop searching, Prospekt's The Illuminated Sky is the one you really need!